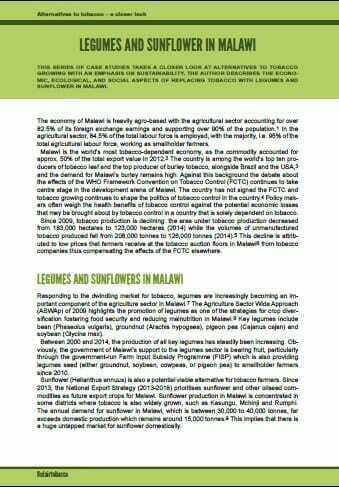 This case study analyses the prospects of legumes and sunflowers as an alternative to tobacco for smallholder farmers in Malawi. The country’s strong dependence on tobacco exports (approx. 45% of export revenue) is a great risk for the economy of the state. The past years, the government tries to advance the diversification of Malawi’s agriculture. The author researches on alternative livelihoods to tobacco growing already for some time. He also visited a GIZ project promoting the value chains of legumes and sunflower. Which plants are growing well and promise enough earnings? How does the government support the diversification of agriculture? What are the challenges of growing soybeans and sunflowers? Soybeans, groundnuts, and also sunflowers are promising alternatives to tobacco.